The recent decision to legalize marijuana in Canada has resulted in an explosion of growth in the cannabis industry across the country. Dozens of companies are developing cannabis products, renovating retail spaces, and laying corporate groundwork in anticipation of the official legalization, set to take effect today October 17, 2018. Many international companies such as Corona have also partnered with notable Canadian cannabis companies opening up new markets for companies across Canada. This international interest in the Canadian marijuana industry means that many of these Canadian companies are now involved in corporate matters overseas in places such as Uruguay, where Cannabis is also completely legal. As in other corporate matters, intermingling with foreign businesses involves a lot of documentation and red tape. These documents can range from certificates of incorporation, corporate board resolutions, corporate agreements, and corporate powers of attorney. The red tape includes the various processes involved in exchanging legal documents between countries which are likely unknown to many up and coming cannabis corporations in Canada. New terms like apostille, attestation, and authentication and legalization add to the confusion of an already complex task of creating a new Canadian industry. As the experts in Canadian documents for use overseas, we have helped thousands of Canadian businesses with their foreign affairs and are here to help you with yours. Although there are many processes for validating legal documents issued in foreign countries, Canada uses the process of authentication and legalization. 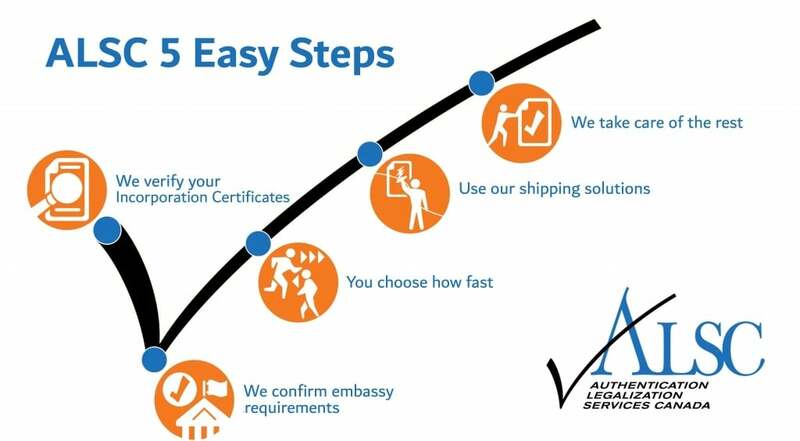 This is the process that was used by countries which currently use the apostille process before the Hague Apostille Convention, which Canada has not signed. If you have Canadian documents which need to be used outside of Canada, you will need to go through this process regardless of the content in the document. It can take over a month to make your Canadian corporate documents valid for use overseas without assistance. This is because Global Affairs Canada alone can take up to 20 business days to authenticate your documents, and the embassy of the country which the documents will be used in has their own additional processing times which may vary substantially. There are also many layers of requirements and fees involved. If you have any Canadian corporate documents, whether they relate to the marijuana industry or not, they will first need to be notarized by a Canadian lawyer or notary public. This will make them valid for authentication at Global Affairs Canada, who place their stamp, seal, and signature on your document stating that the signature from the lawyer or notary public is authentic. Legalization consists of the same steps but instead involves validating the signature from Global Affairs Canada by the consul at the embassy after their requirements have been met. In short, authentication and legalization is a process of validating signatures from certified individuals who have legal authority. Once this process is complete, your Canadian corporate cannabis documents are ready for use outside of Canada. Unfortunately, you will have to go through this process multiple times if you intend on doing business in multiple countries. Thankfully, you have the experts here to take care of it. Making your Canadian cannabis documents ready for use in a foreign country can be a daunting time consuming process without an expert by your side. The long list of requirements, fees, and processing times can be a nightmare when rushing to meet an important deadline. We saw the need for a service to facilitate this complex process and for over 25 years we have remained the leaders of the authentication and legalization industry. As the first company to provide this service, we are also familiar with the struggles of establishing a global brand. We have worked with thousands of Canadian professionals and Canadian businesses including many in the booming marijuana industry. As happens with emerging industries there is a sense of urgency and to help with this we can save you up to 20 business days of processing time on our priority same day authentication service. This means that one of our agents personally presents your documents to the agents at Global Affairs Canada during their limited operating hours the same day your documents arrive in our office, bypassing the otherwise month-long waiting time. Having worked with dozens of embassies in Ottawa and consulates across Canada for over two decades, we have built strong professional relationships with their staff which has allowed us to provide an unparalleled level of service to our clients. Always the first to know about changing requirements and fees, our agents are always available during our operating hours to answer your questions and address your concerns via phone or email. As our client, you become eligible for free shipping of your documents at any one of our service centers across Canada. Our proud membership with the Canadian Chamber of Commerce, A+ rating with the Better Business Bureau, and dozens of verified 5-star reviews on Facebook and Google are testimony to our professionalism and efficiency. If you have Canadian corporate documents relating to marijuana that need to be used overseas, contact us by clicking the button below.